I have created a piece of Three-Legged Dolphin art for the third annual Arts Night, held each year at the Macaulay Honors Building located at 35 West 67th Street, near Lincoln Center. The event featured the work of talented CUNY students, who feature their drawing, painting, photography, illustration, sculpture, mixed media, and performance pieces (am I leaving something out?) There is also a live stage component in which singers and dancers perform brief sets to a captive audience. Arts Night was created by Hunter College students Tyler Alterman and Mary Williams, and the first event was held in 2009. 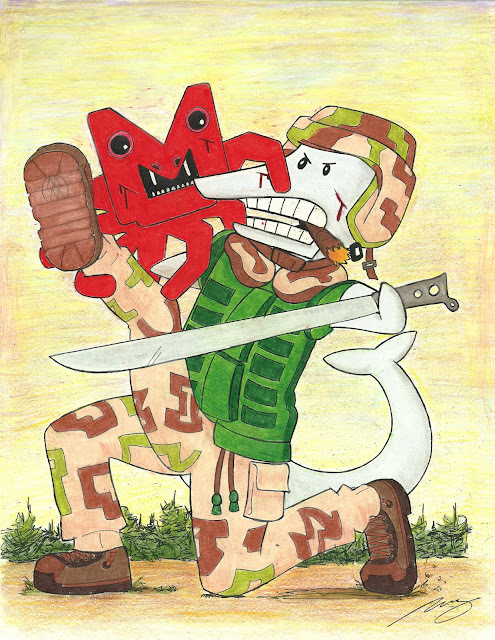 The Macaulay Septopus, the mascot of Arts Night and opponent of the three-legged dolphin, was designed by Mr. Alterman as well. I was the College of Staten Island curator during the first year and had the privilege of meeting a number of great people. Now in its third year, Arts Night is run by the amazing Katie Alarcon, along with Emily Monaco, Natalia J. Donofrio, Jenna Jankowski, and many others I may not be mentioning. I can't wait to see what they have planned for this year. I'll be there enjoying the show and distributing issues of O3LD. Come to Arts Night on April 29th from 4:30 - 9:30 at the Macaulay Building! Also, be sure to visit the Arts Night WordPress where you can find event updates. And don't forget to submit by this Friday, April 8th!